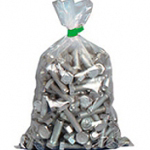 Our wide range of tear resistant, heavy duty polythene bags (approximately 400 gauge) are suitable for storing heavier items and metal items such as nuts, bolts and screws. They are often used by builders for storing sand. Our wide range of light duty polythene bags (approximately 100 gauge) are suitable for storing or packaging light, smaller products. Our wide range of medium duty polythene bags (approximately 200 gauge) are suitable for general purpose use.